The inspiration for this new potato, pancetta and goats cheese frittata came from my love of new potatoes with bacon and mint sauce. It was one of my favourite summer dishes growing up and still is now. However, I don't need to wait until the summer thanks to Tesco and these delicious Cypriot new potatoes. The Cypriot new potatoes are available from Tesco loose or in the 750g packs such as that pictured above. After a quick wash they can be boiled, steamed, roasted or baked. There is no need to wait until the summer to enjoy new potatoes as the Cypriot new potatoes are instore until the end of March. This new potato, pancetta and goats cheese and frittata is a quick, easy and most importantly delicious lunch. Thinly slice the Cypriot New Potatoes and heat in a frying pan (with metal handle) with a small amount of oil. Cut and thinly slice the red onion and add this and the pancetta to the frying pan with the new potatoes. Fry for around 5 minutes until the pancetta is browned and the onions softened. Whisk 8 eggs and add to the frying pan. Dot the top of the frittata with goats cheese and place in the oven for around 20mins. 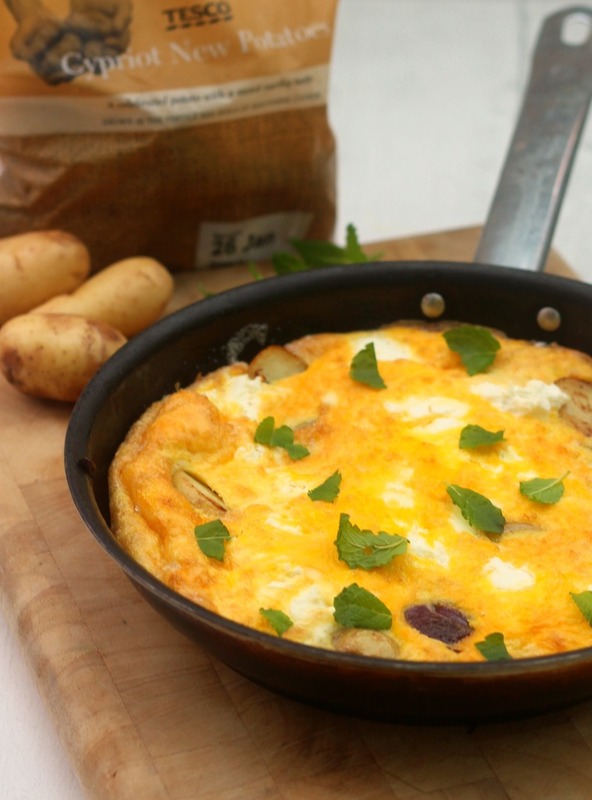 When the top of the frittata is browned, take it out of the oven and top with some fresh mint. What is your favourite recipe with new potatoes? Have you tried the Cypriot New Potatoes from Tesco? This is my entry to the #CypriotNewPotatoes challenge on Foodies100 with Tesco. The ingredients were supplied by Tesco.